THIS CONTEST IS CLOSED. Thanks for participating. Monster Wash was started in 2013 by ARTmuffin. He wanted to offer an alternative to the cheerful flowers and fish commonly found on soap dispensers. Using his artwork, he designed a line of collectible soap dispensers, and Monster Wash was born. They are horror themed, collectible soap dispensers for horror fans and for the love of the genre. Since you all are a bit skull obsessed, Monster Wash is giving away a Bone Soap dispenser to two lucky Skull-A-Day fans! 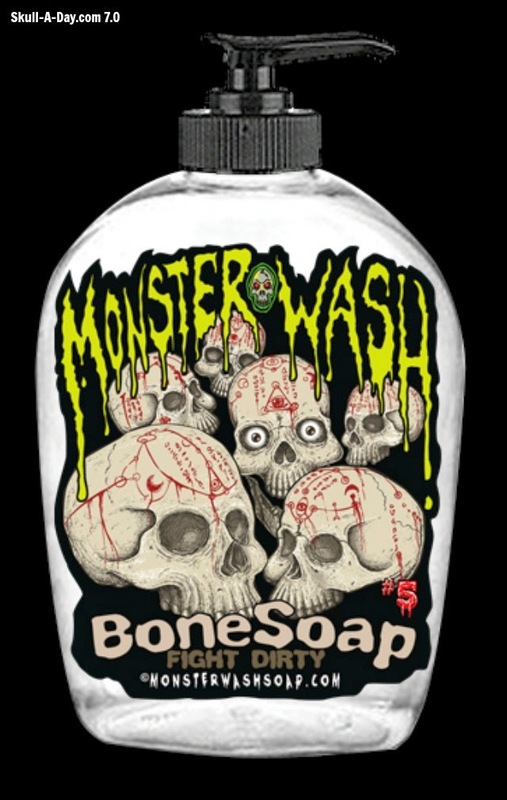 PRIZE INFO: Winners will receive one free Monster Wash soap dispenser with the "Bone Soap" skulls design on the front. Liquid soap is not included. They come empty, so you can add your own desired soap. HOW TO ENTER: To enter this contest, comment below with an answer to this question. If you had a pile of dirty bones to wash, how would you wash them? For example, I'd probably sit outside and wash the dirt off with a garden hose. Then, scrub them carefully with a toothbrush. CONTEST CLOSES: 11:59:59 PM Eastern USA Time Friday, April 4, 2014. IF YOU DON'T WIN: Don't fret, Monster Wash is currently having a sale. You can buy a 3 pack (including Bone Soap, Zombie, and Suds of Cthulhu) for $18. Head over to Monster Wash, to get that deal. To get an update on when other designs will be released, check out their Facebook page. 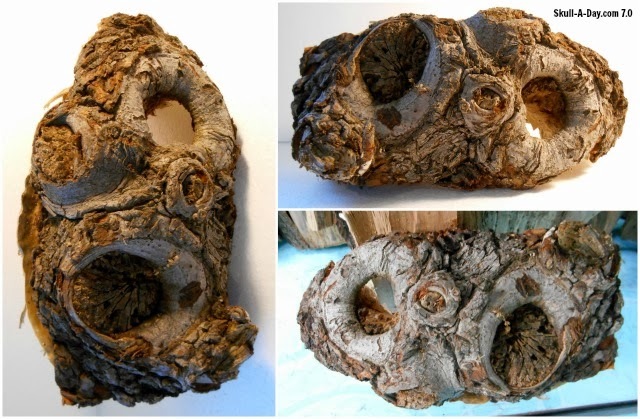 Today's simulacra skulls were found on trees. Tim said "A final curse from the former shade tree in the front yard composed in fungus? Yikes! Glad it's not my house. 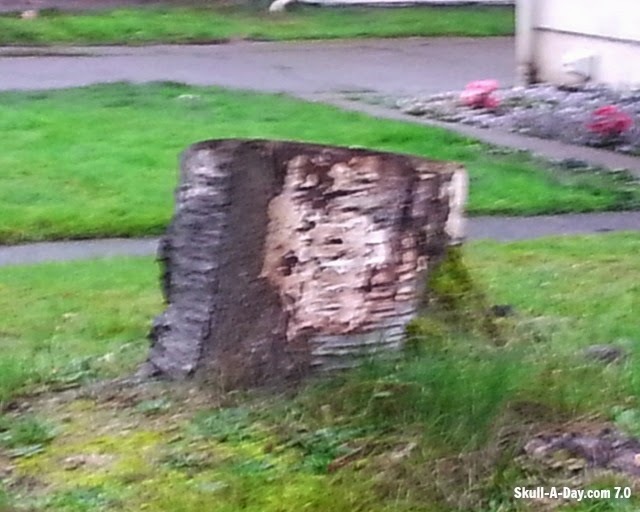 I drive by this stump everyday on my way home from school where I am student teaching in a special education classroom in Albany, Oregon." Emailus Genericus found this skull on a tree along a sidewalk. If you've found a simulacra skull, please submit it to us. We love sharing what our skull hunters find! 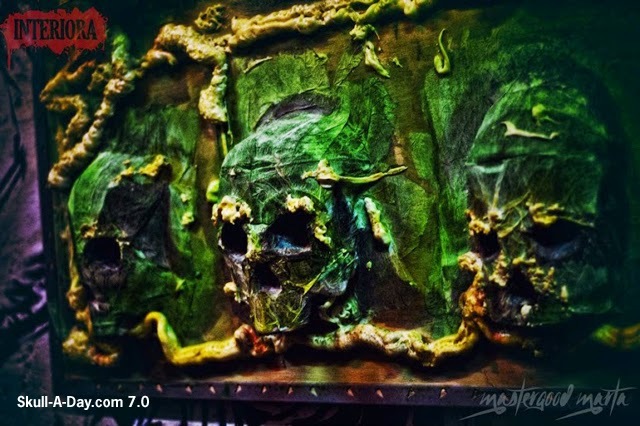 Mafio73 is a mysterious paper mache artist who shared more of his excellent skulls than he did of himself. 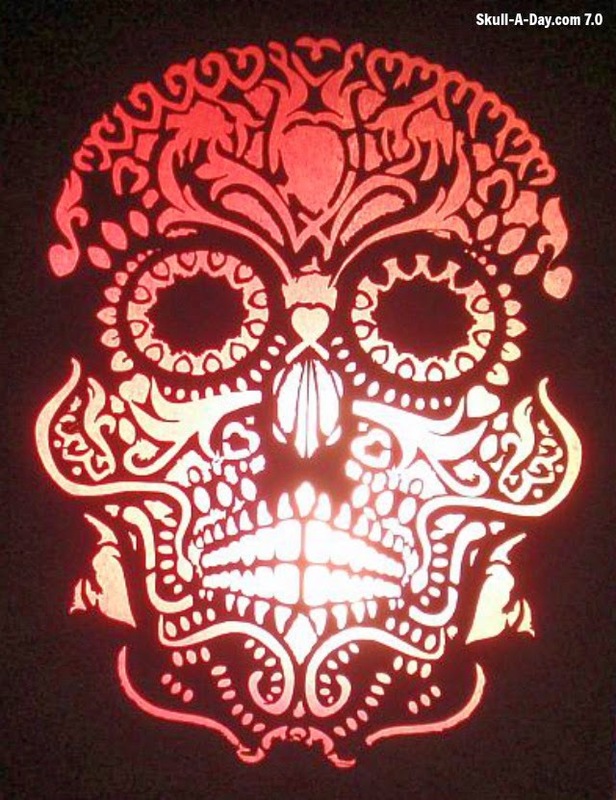 We know that he is in Rome, Italy and is pretty adept at making some killer paper skulls. Please enjoy this small handful of what he shared. Grazie, Mafio73! 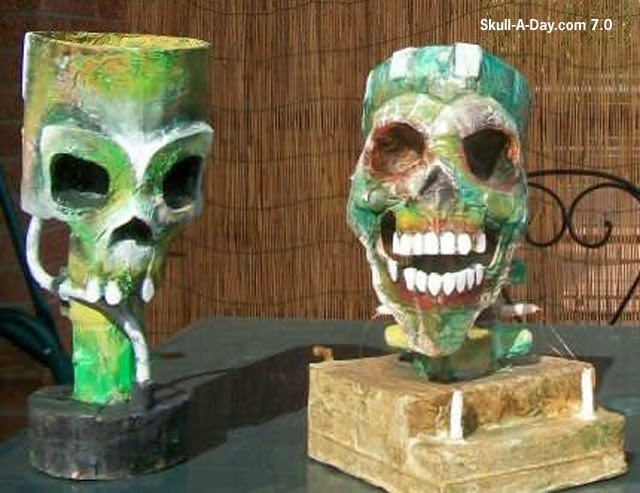 Holden McCormick, age 14, used topography, as his inspiration for this skull. I had to look more into topography to understand the lines in the skull. Topography is part of map making. It deals with the 3D space...the elevations of mountains, hills, valleys and everything in between. I live in an area with lots of hills, valleys and curves. Occasionally, I'll see a couple surveyors along a steep curvy stretch of road, attempting to figure out the lay of the land. Tina Carrello and her daughter Shea are from Sparrow Bush ,NY. They wore this skull makeup for a haunted attraction they run in Otisville, NY called Fright Nights at Pierson's Farm. Some of the best makeup I've seen has been at haunted attractions. There is a lot of dedication to the art of fear. You want the patrons to believe you are real and not just a character. If I saw these ladies along a dark pathway, I'd be a little frightened. This wonderfully crocheted beauty is courtesy of Sidony Tricote of France. 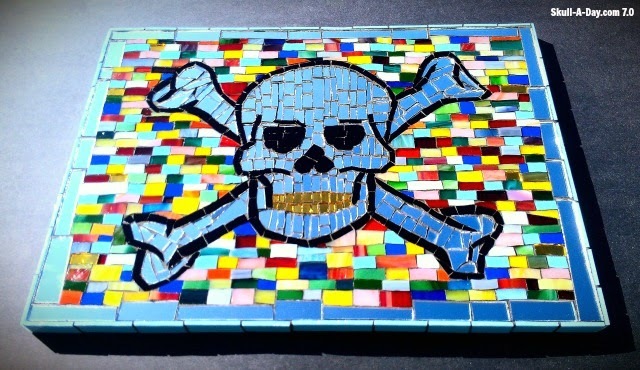 A myriad of colors combine to add a bright cheerfulness to this warm symbol of death. To me, it's looks a lot like a hacky sack skull. Thanks for brightening our day, Sidony! 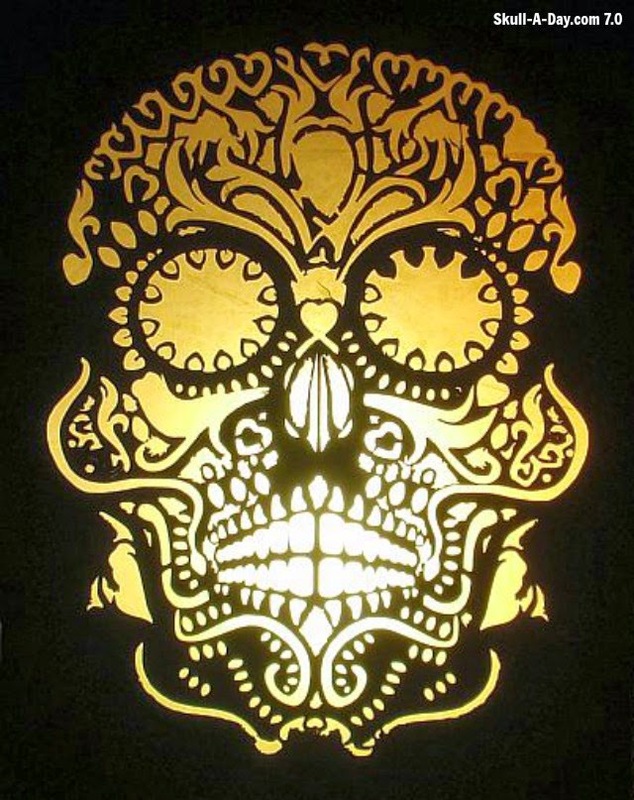 Jacque Frazee is the man behind the metal of K-Do metal art. He's big into upcycling scrap metal into new and lively sculptures. 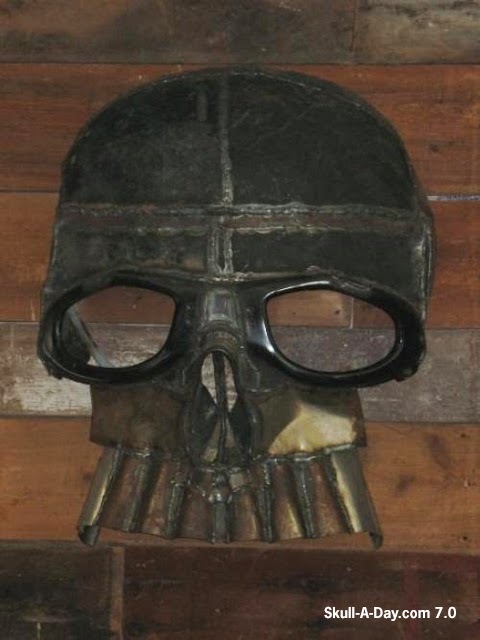 This skull is made out of a bumper, inner fenders, and exhaust pipe. The second pic is an earlier unfinished version that I thought had dark and foreboding qualities that had to be shared. Thanks for sharing your work with us, Jacque! 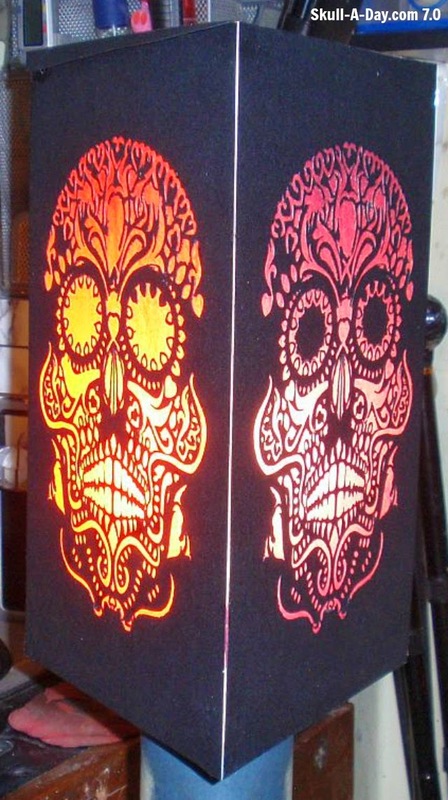 Bat Fastard is back with us, to show a three sided sugar skull lamp shade that he created. Lamp shades are often boring and plain. This one is a refreshing take on a staple houseware need. I'd love to see if the skulls are cast onto the walls at night. Colin Kilpatric is a great skull hunter. 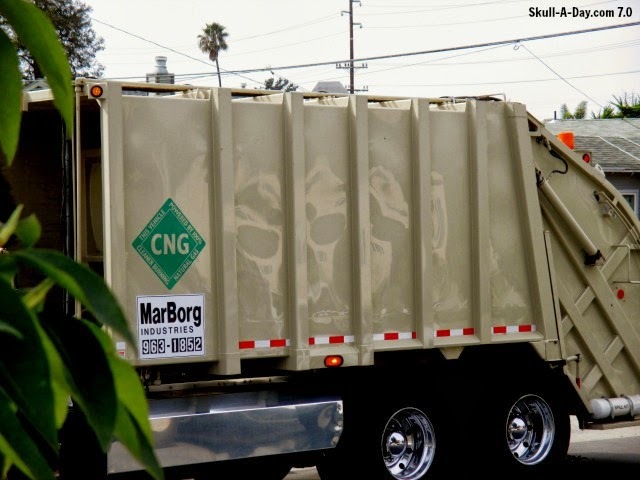 He found one on the side of a garbage truck. 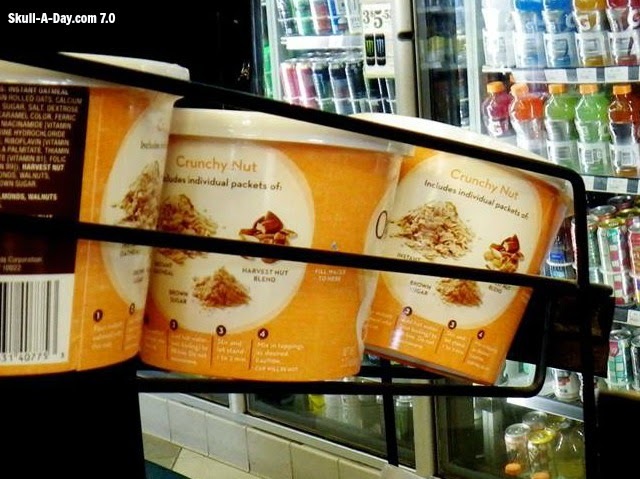 At convenience store in Santa Barbara, CA, he found some on food packaging. With a little searching, I found out it's the N'Joy Gourmet Oatmeal Kit in Crunchy Nut. If you've found a simulacra skull, please submit it to us. We love sharing what our skull hunters find! 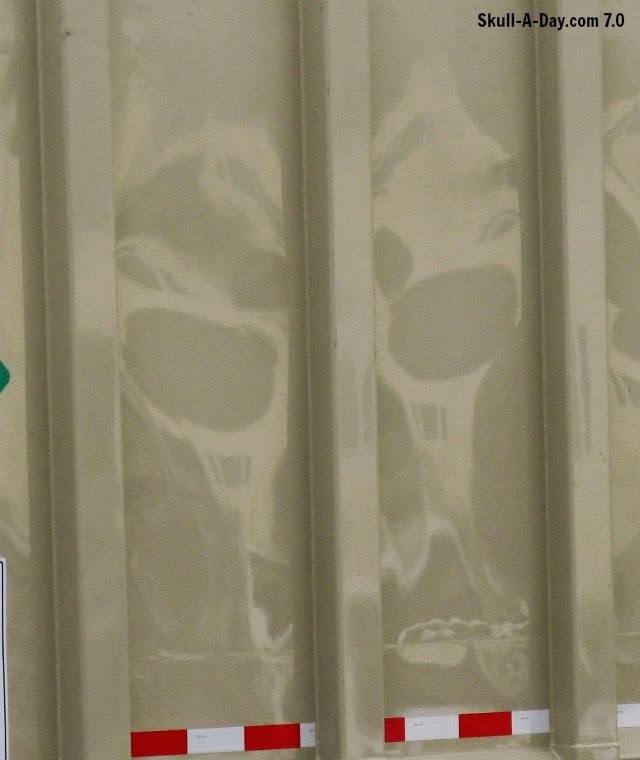 If you are having trouble locating the skull, I've cropped it for you. Mr. Snake, a.k.a.- Rob Cardenas, a.k.a.- Robthesnake presents us with a skull design he's created for his clothing brand. He's recently started studying engraved skulls and this "gem" is a spectacular start. A little bit pirate, a little bit old school tattoo, and a whole lot of "exskullence"! Thanks, Rob! Don't forget you have until 11:59pm Eastern USA Time TODAY, Friday, March 21, 2014, to enter the the current giveaway. Denise O'Sullivan is giving away "Death by Music" mugs to ten lucky Skull-A-Day fan. You can find the original contest post by clicking the side bar ad, or this link. With Spring finally arriving, yet another snow storm about to hit, I figured another snow skull would fit in fine. 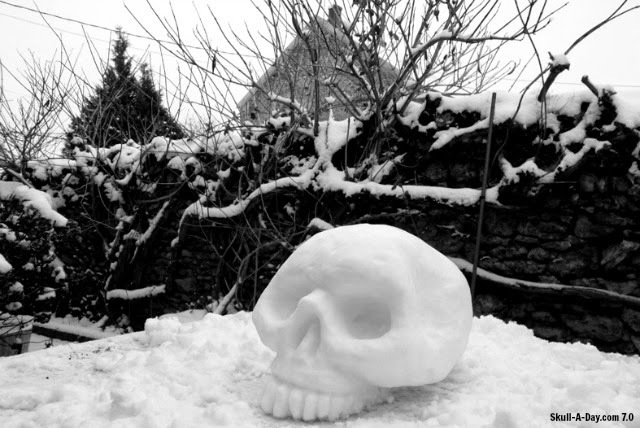 Antoine Lemonnier created this snow skull in Fouju, Seine-et-Marne, France. I'm hoping the next storm isn't heavy like past March storms. If it is, I hope to see many snow skulls being made. Below the original photo is an animation Google randomly made, by adding falling snow to the photo. It looked so nice, I thought you all would enjoy it too. If you make a snow skull, please submit it to us. Silvia Rosenfelder-Schechtel is an artist from Merritt, BC. She's been working in mosaics for the past 3 years. We had a conversation about her artwork, asking how it was made...an existing or original skull. 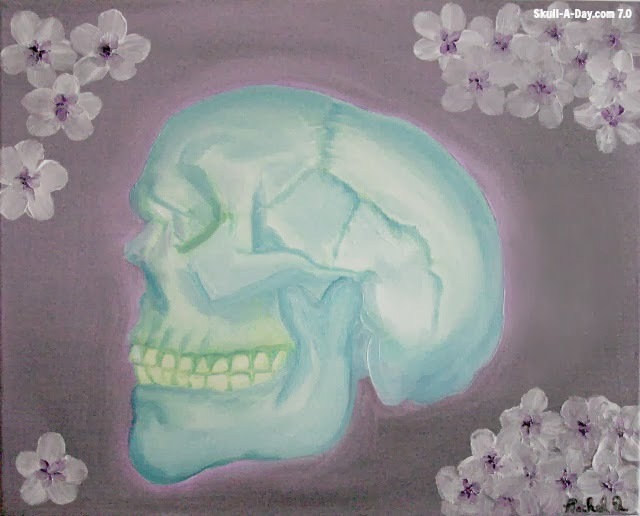 Since we normally only post artwork that has a handmade skull, she created this new piece for us to share. This wall piece is 12" x 17". 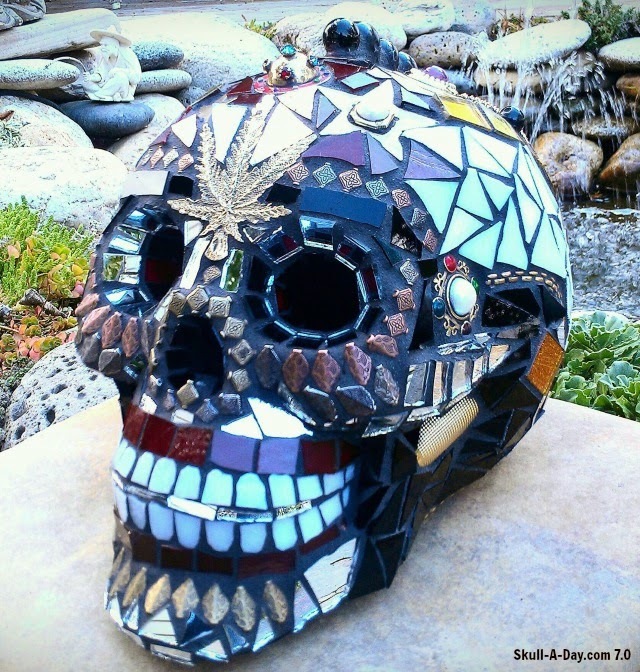 It's made of hand cut mirror and tiles. To show her range of work, I included the sculpture and birdhouse, which show great reuse of old things. You can see more of Silvia's work, check out her Facebook page, MS Creations. Don't forget you have until 11:59pm Eastern USA Time, Friday, March 21, 2014, to enter the the current giveaway. 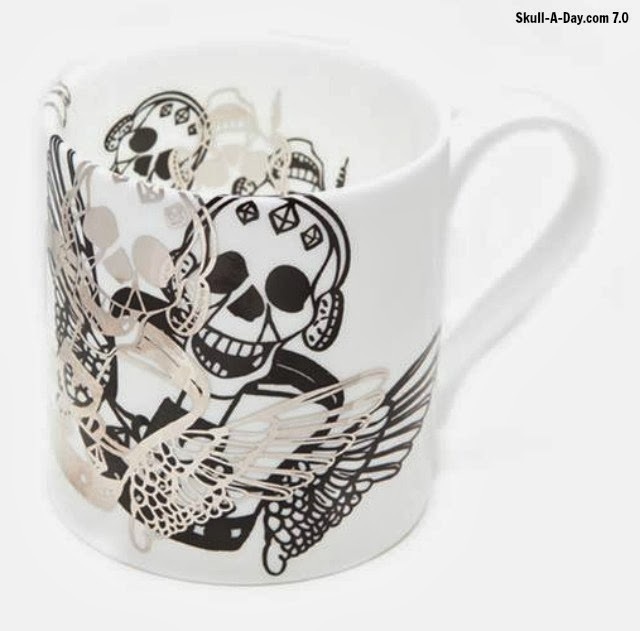 Denise O'Sullivan is giving away "Death by Music" mugs to ten lucky Skull-A-Day fan. You can find the original contest post by clicking the side bar ad, or this link. If you've ever got an hour and a half to kill then maybe you could spend it like Vincent Drummond of England. His micron pen has stippled some superb skulls, including this one. The caption from his site says it best, "1 and a half hours, 3 quarters of Indiana Jones & the Kingdom of the Crystal Skull & 100% handcramp later…". I'm glad you made it through the pain and submitted this to us, Vincent. It was well worth the effort. Thanks! Today's grinning devil skull is from Tom Hurlock of South Wales, UK. This piece is part of an ongoing tarot /tattoo project. 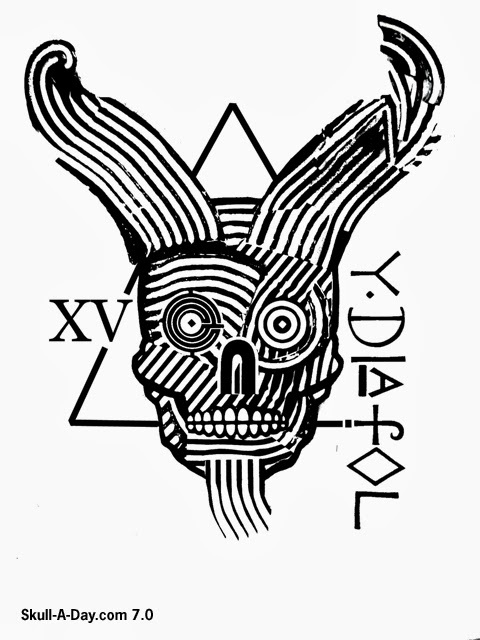 Y diafol is Welsh for the devil, a regular character in Welsh folklore. Also, a fitting representation for the Death card in the tarot deck, and of course an obviously popular choice for a tattoo. Thanks for dealing this to us, Tom! Denise O'Sullivan is a British designer, making design led ceramic gifts, limited edition collections and artworks. 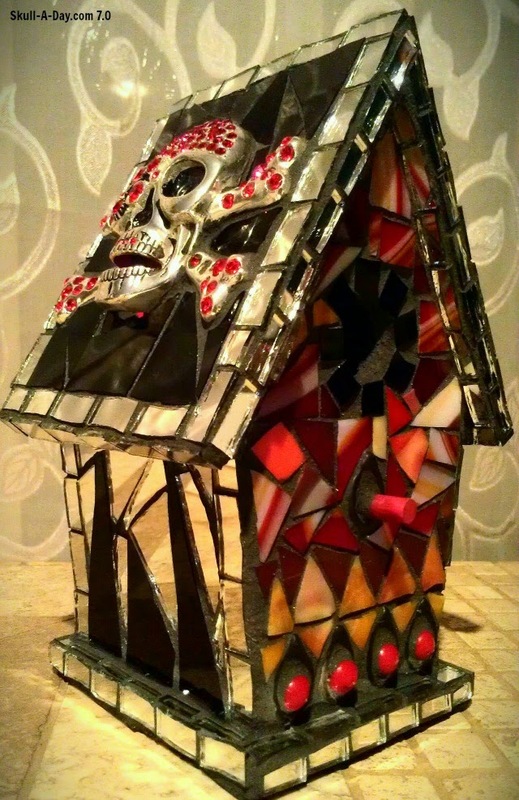 She has a distinctive style and finish to products using metallics and bold imagery. Denise's mugs are made of fine bone china produced in Stoke-on-Trent, England. 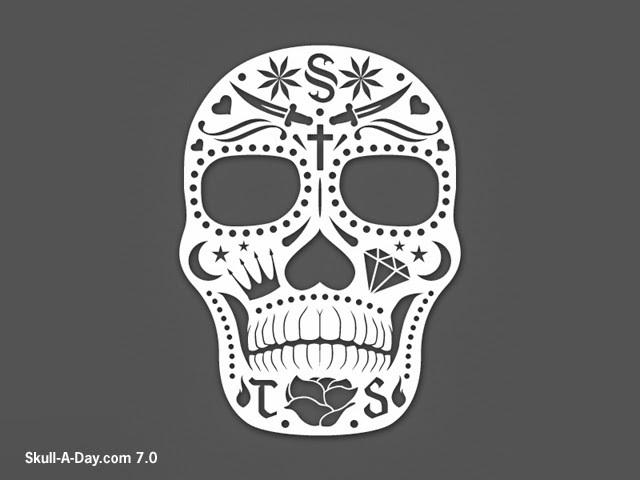 Her most popular design is "Death by Music", which is done with a mix of platinum and 24ct gold skull finishes. Denise is giving away 10 of these mugs to Skull-A-Day fans! 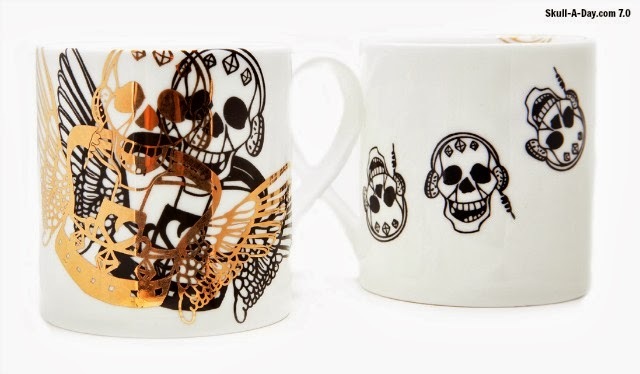 PRIZE INFO: 10 "Death by Music" Skull mugs in a mix of platinum and 24ct gold Skull finishes. HOW TO ENTER: Mugs can be used for many things...drinking, eating, and storing things. If you won a "Death by Music" mug, how would you use it? For example, I'd likely use it for hot chocolate, or a warm brownie and icecream. Comment below with your answer, as your entry. CONTEST CLOSES: 11:59:59 PM Eastern USA Time Friday, March, 21, 2014. 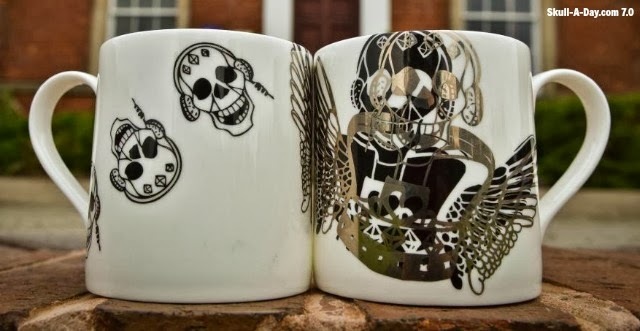 IF YOU DON'T WIN: Denise is offering a 10% discount on all of her Skull designs in her shop Denise O'Sullivan Ceramics, until the end of March. Enter discount code "SKULLADAY" at checkout. You can see what else Denise is creating on her Twitter, Facebook, Instagram, and Pinterest. Today's skulls are wood. 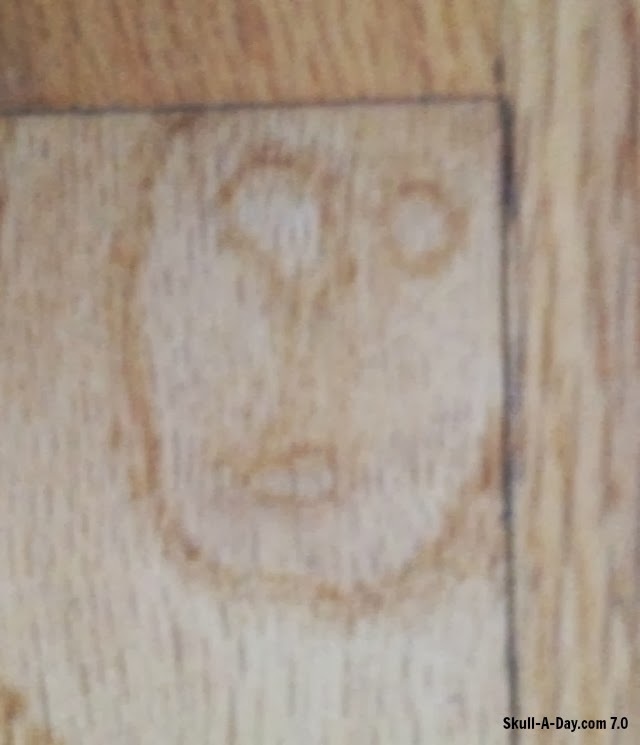 Lenore Beebe explained, "I discovered this little guy in the floor boards of a home where I was pet sitting this past week. I named him Woodrow. I think he looks a bit like he might be a distant cousin of the dude in the painting 'The Scream'." Denise explained "I was putting wood in the stove the other day and had to take a picture of this log, at different angles, because I couldn't decide which I liked best." If you've found a simulacra skull, please submit it to us. We love sharing what our skull hunters find! This hellish creature is a powerful illustration from Andrea Boroš of Novi Sad, Serbia. What I see is a picture of eternal torture which inspired me to write the following haiku. Thanks for the inspiration and for sharing your work, Andrea! 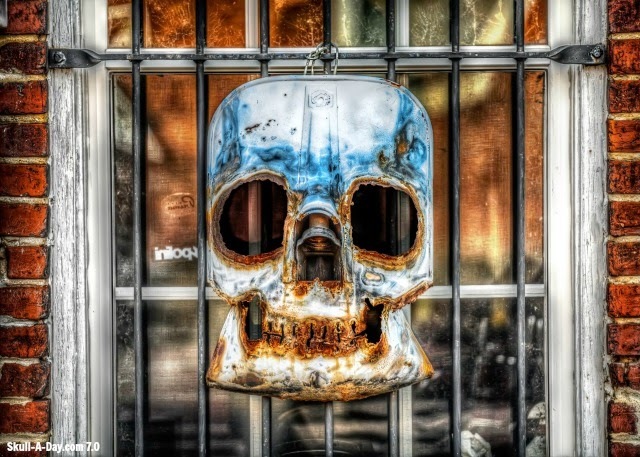 Bill Dickinson (Sky Noir) took a photo of Noah's now rusted Scooter Skull hanging outside of Scoot Richmond. 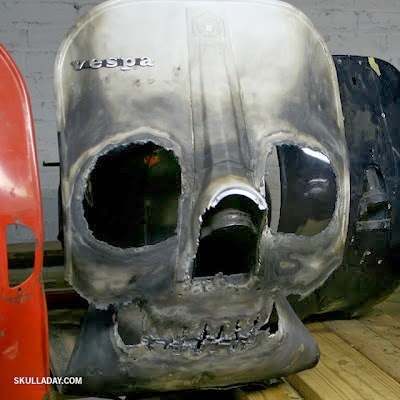 The original skull cut into a rusted out scooter body back in 2008. Looks like over the years it's become gruesome with additional rust. Thanks for providing us with an updated photo Bill! For comparison, here is Noah's Scooter Skull, before 6 years of rust. Don't forget you have until 11:59pm Eastern USA Time TODAY, Friday, March 14, 2014, to enter the the current giveaway. 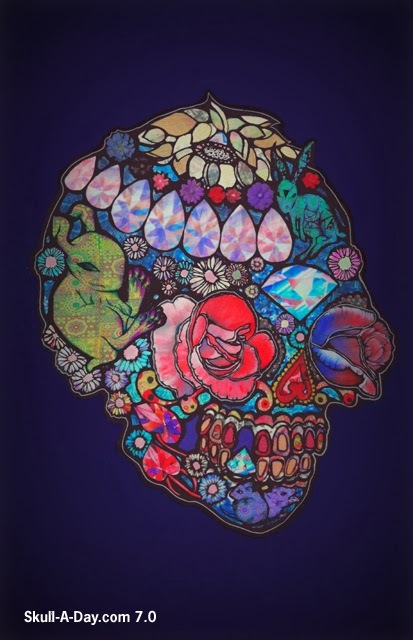 Rachel Quinlivan is giving away a "Crystal Skull" print to one lucky Skull-A-Day fan. You can find the original contest post by clicking the side bar ad, or this link. 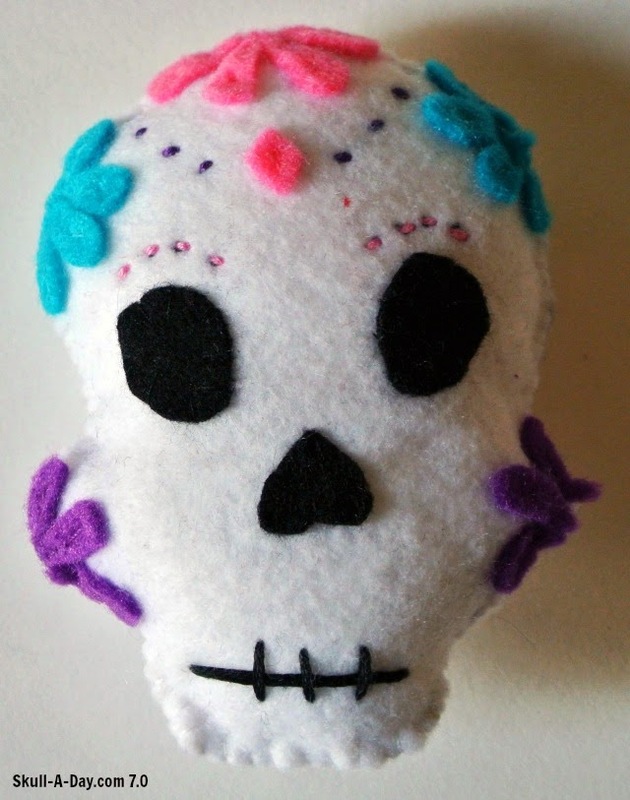 Lydia Leigh from Sheffield, UK, created this felt sugar skull. I love seeing hand made toys and soft sculptures like this. I've been sewing for a few decades, but sadly I'm terrible with soft toys. There is no indicator of scale for this skull. I'm hoping it's human sized, as that would make for amusing photos...and a lovely pillow. Don't forget you have until 11:59pm Eastern USA Time Friday, March 14, 2014, to enter the the current giveaway. 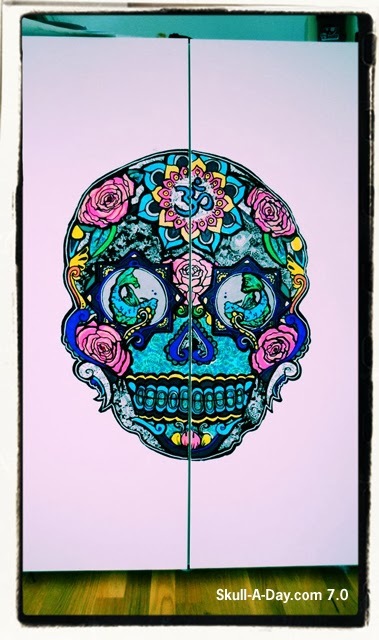 Rachel Quinlivan is giving away a "Crystal Skull" print to one lucky Skull-A-Day fan. You can find the original contest post by clicking the side bar ad, or this link. Cayce McCall had the chance to do some face painting at "the best wedding I've ever been to". 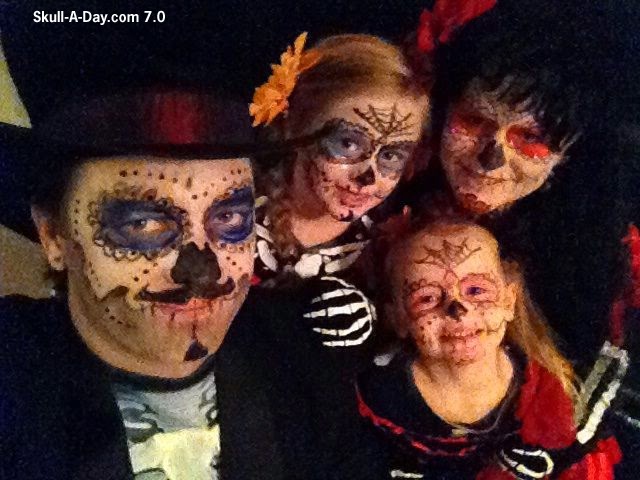 Justin Jaymeson painted these fancy faces of his family for some trick or treating last Halloween. Determined not to let the Death Head Moth receive a bad reputation because of one movie, Danny Hernandez is buzzing our scene with a newer, more festive version. Instead of appearing lodged in the throats of murder victims as a sign of transformation, Danny's moth is appearing here in celebration of another day that your skull gets to appreciate this one. Now, go rub some lotion on your skin(you know you were thinking it). Thanks for sharing, Danny! Rachel Quinlivan is an American artist who specializes in oil paintings. Many of her paintings are fossils and skulls, but she's also done animal portraits. She is inspired by fairy tales and ghost stories. You can check out her work in her etsy shop, Quinlivan Art Emporium, and on her Facebook page. 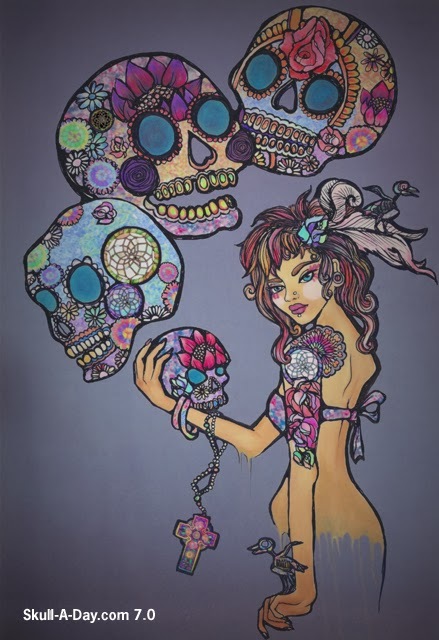 She wants to share one of her recent paintings, "Crystal Skull", by giving away a print to one lucky Skull-A-Day fan! PRIZE INFO: One 8"x10" print of "Crystal Skulls" on metallic paper. HOW TO ENTER: Rachel is often inspired by fairy tales and ghost stories. To enter, comment below telling us your favorite fairy tale or ghost story. For example, I like "A Midsummer Night's Dream" and any ghost story with historical ties. CONTEST CLOSES: 11:59:59 PM Eastern USA Time Friday, March, 14, 2014. IF YOU DON'T WIN: Don't fret, in Rachel's shop, Quinlivan Art Emporium, there is a 10% discount on all orders over $25 until Sunday March 9th. Enter coupon code QuinlivanArt1 at checkout. Today's skulls are large rocks. Rand Workman says this rock is in his front yard on Whidbey Island in Washington State. Jenny J Rock found this skull within the rocks of a stream. 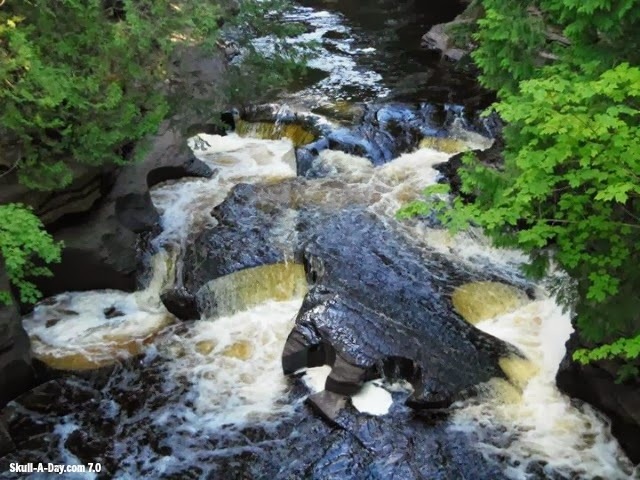 Look on the left side of the front rock formation, in the white water. If you've found a simulacra skull, please submit it to us. 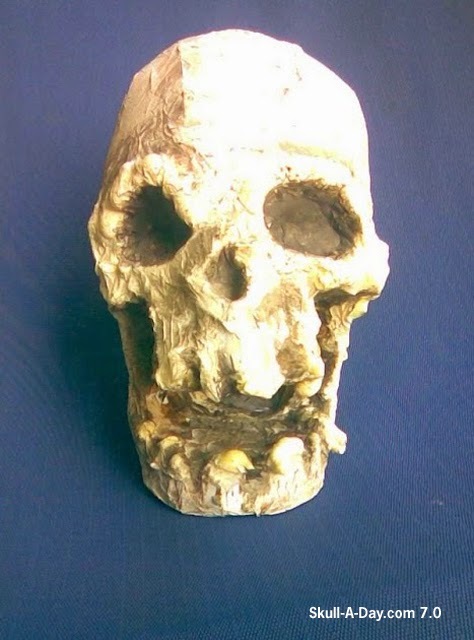 We love sharing what our skull hunters find! "Izzy Cammareri and Lynsey Morgann Laurence met whilst studying Illustration under Bill Wright at Central Saint Martins College of Art and Design in London. Between them they have resided in London, Hong-Kong and Australia. A global alliance; when unable to work together they share and plan ideas online. Exhibiting throughout London, in recent years they have forged the art and illustration company; Sugarskills. 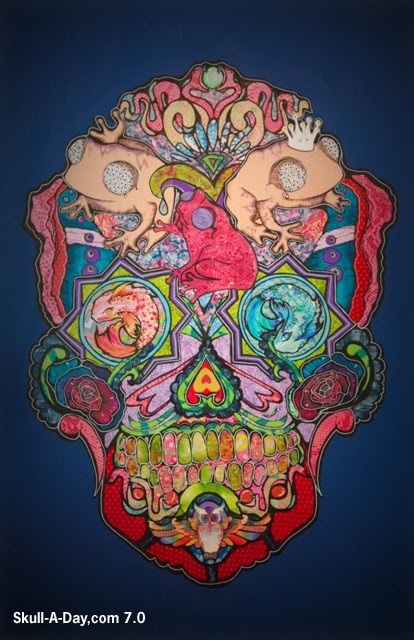 Isabella and Lynsey devise sugar skull designs that have the dreams, desires and demons of a departed soul painted and collaged across the forehead. Based on no one person, each skull asks the onlooker to play the part of both dream interpreter and forensic anthropologist. Once engaged with the subject you are challenged to solve some part of it’s identity; to decipher the complex and detailed story of it’s perpetual life. 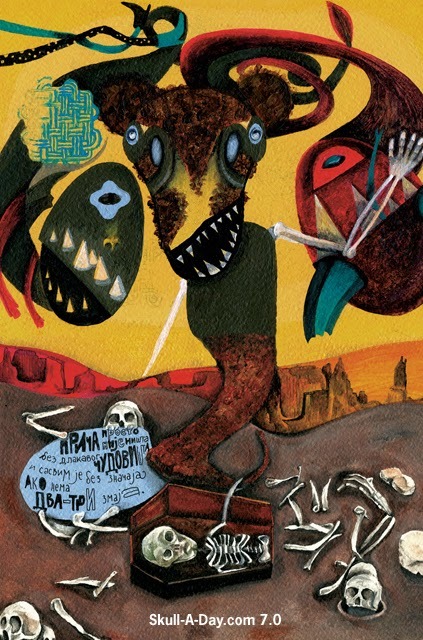 Both mysterious and evocative, disturbing and comical, each skull holds a labyrinth of symbols and imagery that beckons the audience into a wonderland of cavernous questions and profound discoveries. 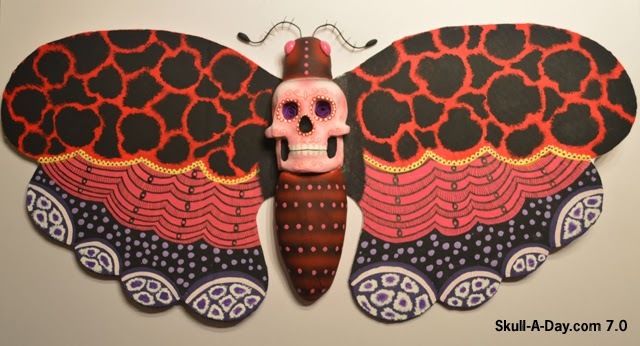 Together the girls of “Sugarskills” take the totem metaphor of death and dance with it. Their work is a series of appositions; chaotic but ordered; moribund but hopeful; as wise as it is immature. Each canvas is celebratory, mischievous, calculating; sentimentally childish and unapologetically spirited. 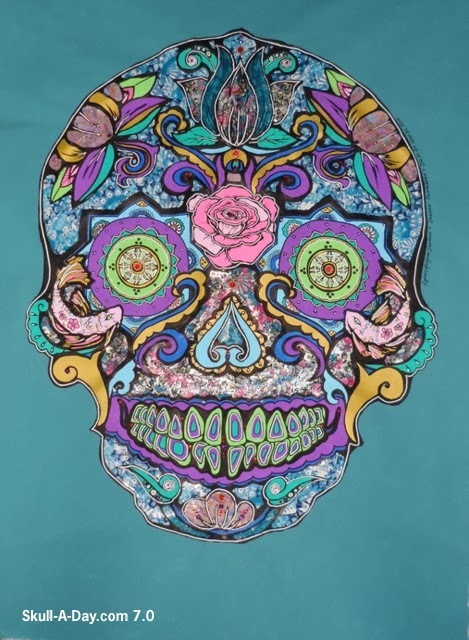 Impishly waltzing through layers of creativity like a pair of rogue opportunists; Izzy and Lynsey pick up the bare bones of life and puckishly paint them into a myriad of Mexicana colours. With every stroke they dare the on-looker to come and play with them." 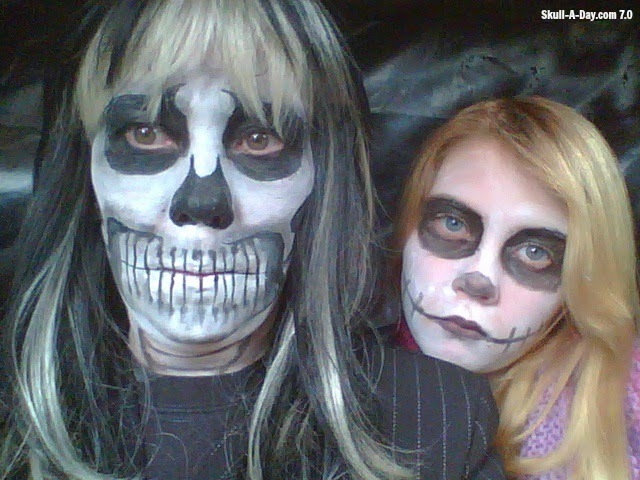 Thanks for helping to make this Saturday super skullified, Isabella and Lynsey!